Inside the Box: March 2017 — myblackbox co.
Getting from idea, to building the foundation, to launching blackbox has been quite the ride. It has been one that is well worth it. March's box is the first ever blackbox! 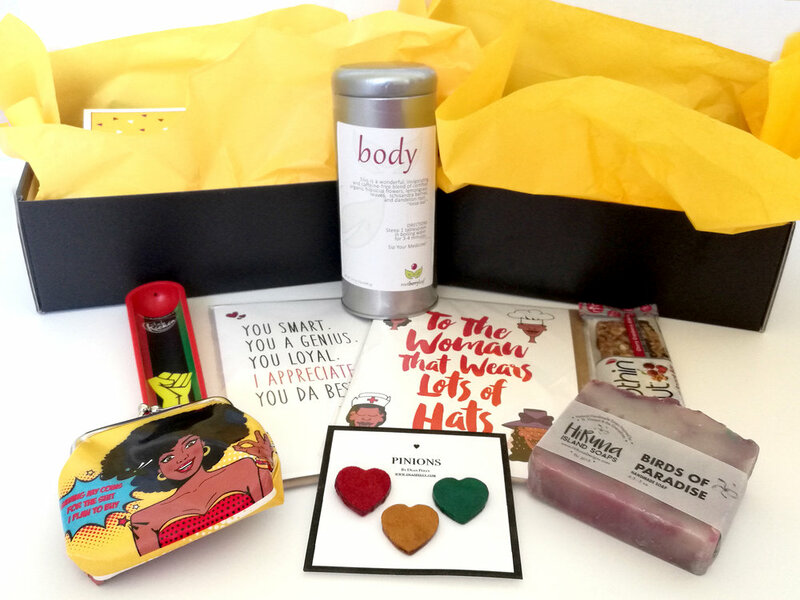 Although, each box is carefully curated with great finds from Black-owned businesses, this box will always hold a special place in our hearts. It's our baby! There was a lot of back and forth, and mixing and matching of products as we selected items for the first blackbox. We wanted to showcase items from all of our categories: Bath & Body, Food & Drink, Fashion Accessories, Home & Office, and Art & Literature. It was also nerve-wrecking trying to select items for the first box for our subscribers (you!) to love as much as we do. Ash Kickin - RBG Flag Incense Burner: Ash Kickin is one of the very first businesses we contacted when the idea of blackbox came about. What we loved about their incense burners was their patented design which makes it nearly impossible to have a mess to clean up after your favorite incense is done burning. They feature a variety of designs in their shop. In addition, Ash Kickin offers candles, incense sticks and reed oil diffusers to complete your home fragrance regimen. By Ms. James - Greeting Cards: By Ms. James offers an enticing selection for her greeting card collection. The artwork is high quality, the look and feel of her cards are high quality and they are well packaged. She also hand-draws a character on her shipping envelopes for a unique, personal touch. The thought and attention to detail provided by Ms. James really reflected the type of fun, yet professional, quality Black businesses we were seeking. Rootberry Leaf - Body Tea: Jamila of Rootberry Leaf knows tea! We were happy to find a tea business owner who was also a naturopathic doctor. She even holds Tea Talks in the St. Louis area. Rootberry Leaf offers a collection of teas focusing on Mind, Body & Soul (and a few things in between)! The aroma of her teas makes the drinking experience all the better. Nothin' But Foods - Cherry Cranberry Granola Bar: We wanted to find something tasty, yet healthy to feature in the first blackbox. Can't go wrong with a granola bar! That's where Nothin' But Foods came in. They offer premium, granola bars and cookies made with fresh, natural ingredients. Nothin But Foods has a unique mix of flavors for their bars and they have winning recipes. Gift box assortments are also available to share with friends and family. HiRuna Island Soap - Birds of Paradise: Marci of HiRuna Island Soap makes a beautiful collection of soaps that make you wish you were on vacation right now! HiRuna Island Soaps has a great assortment of other bath & body items as well such as sugar scrubs, wax melts and body butters. With so many yummy sounding scents, it may be hard to just choose one. Shanieism - Saving My Coins Purse: We love the throwback looking yet modern, off the wall, in your face designs of Shanieism! Owner Shantel, is a gifted artist who brings her characters to life through her designs. There are lots of awesome items to choose from in her collection including tote bags, t-shirts, buttons, purse charms and more. Dean Peezy - Leather Island Pins: Dean Peezy offers a nice collection of chokers and clothing pins (Pinions as owner Kaydene calls them). The pins are nice and simple, adding a fun touch to any outfit. The handmade natural to her fashion accessories makes wearing them even more special. And there you have it! Our first blackbox is complete! It was so much fun putting it together and lots of work as well spreading the word to all of our family and friends about our new venture. If you subscribed for the March box, we hope you loved your first blackbox as much as we do! Tell us your thoughts in the comments below - what was your favorite product(s) in the March box? What would you like to see in the future? Tag us on your March box photos with #myMARCHblackbox. And, if you haven't yet, make sure you subscribe for the April box - here.